With two earthquakes hitting central Italy on Wednesday, social media users were quick to capture the devastation on camera. The second Italy earthquake has been rated 6.0 by the USGS. Virtually the same spot as the foreshock, which remains a 5.5. 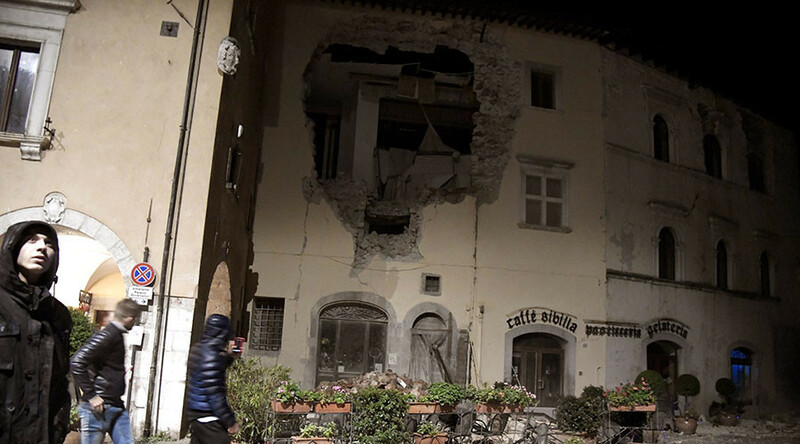 The tremors were strong enough to be felt in Rome, which is over 150 km away and residents reported their homes shaking. “Our village does not exist anymore,” the mayor of Ussita reportedly said. Some buildings reportedly collapsed in the area struck by the quakes. However, the damage is believed to be much less than in August, when a major earthquake hit Marche, Lazio and Umbria regions. Hundreds of people were killed in the August 24 quake and several towns were razed to the ground in the worst-affected areas. Several people were reportedly injured in Wednesday’s tremors, officials in the town of Visso said, and several older buildings – including a church – have collapsed. Some areas have lost power, and several roads remain closed. In Castelsantangelo sul Nera, which has around 300 residents, the town’s mayor Mauro Falucci confirmed that there was no electricity. Although the US Geological Survey initially stated that both earthquakes reached a magnitude of 5.6 followed by 6.4, the estimates were later lowered. Italian Prime Minister Matteo Renzi has halted all engagements and is said to be following developments, according to Reuters. Facebook has also reportedly switched its Safety Check on to allow users to inform others that they are not in danger.